KIEV, Ukraine -- There have been calls for protests in Ukraine following a court decision over the election of Kiev’s mayor that is seen as beneficial to the government and damaging to the opposition. 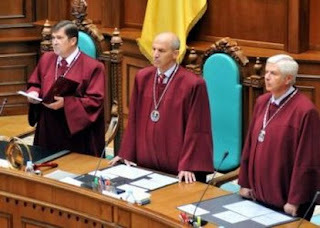 The Constitutional Court ruled that the vote in the capital, an opposition stronghold, should not take place until October 2015. Kiev’s last elected mayor resigned a year ago and President Yanukovich appointed a ruling party member in his place. The opposition have condemned the court’s decision. “The government clearly understands that any opposition candidate will beat any pro-government candidate. If elections were to be held (now) for Kiev City Council, then 90 percent of seats would be won by the opposition,” said Vitali Klitschko from the UDAR party. The opposition now wants to block the city council’s work. The reason the court gave for its decision was that all local elections should happen simultaneously. “Every Ukrainian citizen must abide by the court’s ruling. Anyone can express their opinion or discuss the decision, but it must be implemented. Parliament will set a date (for the election), as indicated by the Constitutional Court,” said Volodymyr Makeienko, an MP from the governing Party of Regions. The issue has brought street protests and even a fight inside city hall. At last year’s general election opposition parties collectively won almost 95 percent of the vote in Kiev. It is thought the impact of the court’s decision could be felt beyond the capital.